Namibia’s highest point looks like a regular grouping of rocky hills from ground level. But from a bird’s eye view (see photo, above) these rocks form a stunning 15km (9 mile) wide circular splotch on the barren landscape of southern Africa. Technically, Brandberg is not a mountain but a granite intrusion formed by magma rising up through a single point in the earth’s crust. Most intrusions harden into a tall, relatively narrow cylindrical shape. What’s unusual — and amazing — about the Brandberg Massif is how very, well, massive it is. Most travelers who make the long, dusty journey to Brandberg do so after hearing about an unusual quality about the place: The way the sun strikes the rocks at sunrise supposedly creates an incredible illusion that the entire mountain is on fire! 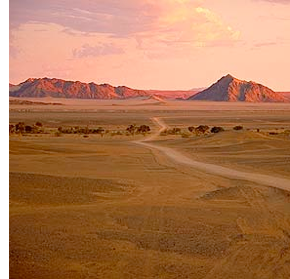 (Indeed, in German and Afrikaans “Brandberg” translates to “Fire Mountain”). For what it’s worth, Spot Cool Stuff has personally woken up before dawn on a very cold morning, hiked up to a good view of Brandberg and then watched the dawning of the day. The closest thing to a fire effect we saw during our sunrise came from our camping stove while making coffee. The Great Blue Hole, bracketed by the Lighthouse Reef 100 km (60 miles) from Belize City in the Caribbean Sea, is right up there with the Similan Islands as one of our all-time favorite scuba diving locations. 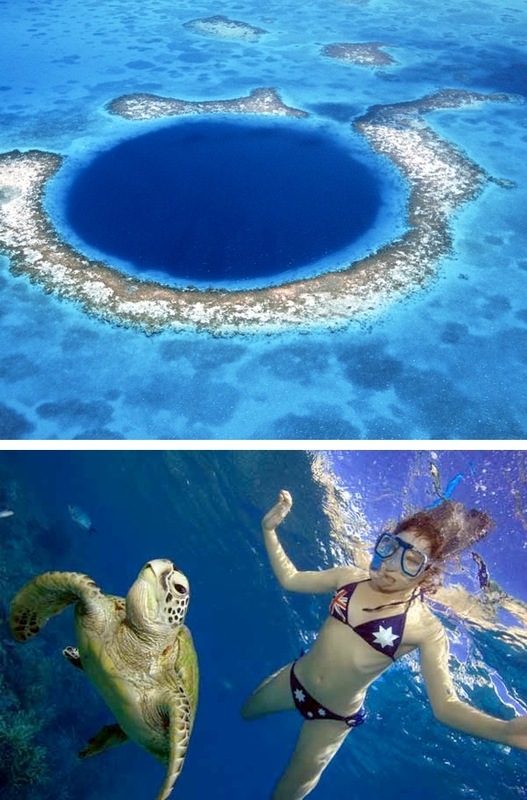 This is not the world’s only “blue hole” (eg. 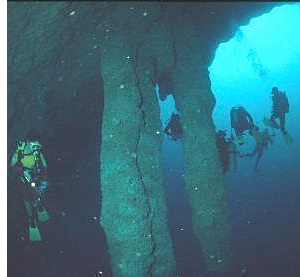 a deep mass of water formed by a vertical coral cave) but, at 400 meters across and 145 meters (475 feet) deep, it is the largest. It also happens to be one of the most perfectly circular. The rich abundance of sea life and spectacular underwater stalactites is what attracts most divers to the Great Blue Hole. But what personally amazed us most was the sheer blueness of it. It is one thing to see blue on a sunny cloudless day, for example. It is quite another to experience blue. To become blue. The third pic below is the best we’ve seen at capturing the feeling of it photographically. The Great Blue Hole has become one of the most popular dive spots in Belize, if not in the whole of the Caribbean, such that there can be something akin to a traffic jam of boats waiting to get in. 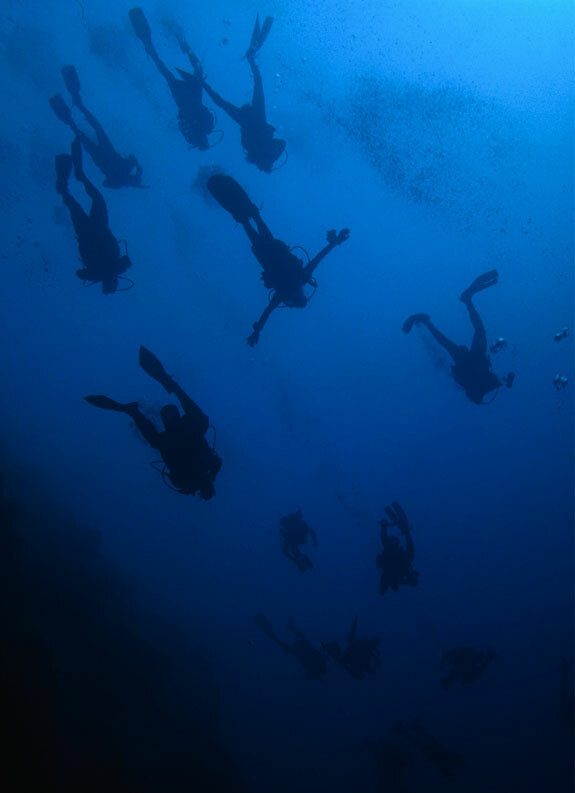 We suggest you plan your dive for either first thing after sunrise or in the off-season. 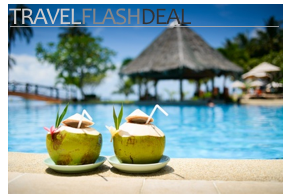 Where To stay: For upscale yet laid-back beach-side glory, the Cayo Espanto reigns supreme. Add this to our travel ideas that are so bad that they’re good: Eastern Siberia’s grotesquely enormous Mirny Diamond Mine. 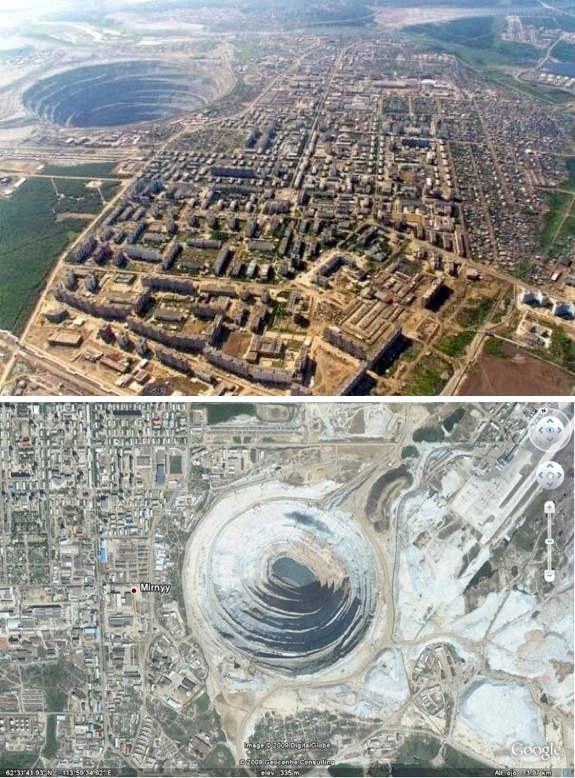 Mirny’s diameter of 1.2km (.75 miles) means that, technically, it is only the world’s second largest open mine in the world (after Bingham Canyon, below). But the mine’s depth of 525 meters, combined with its location at the edge of a 40,000 person town, makes it the world’s most ominous looking. As you can see in the photos, it appears almost like the very planet is swallowing the town of Mirny. In fact, this is not far from the reality of it. Originally the mine was small and far from the town. Then the mine started producing many more diamonds than expected, which not only increased the size of the mine but also the size of the town (as workers moved in). Today the mine employs over 3,000 people. The hole is so large that helicopters and small aircraft can not fly near it without the very real fear of being sucked in! And if you think it’s big today, check it out a few years from now. 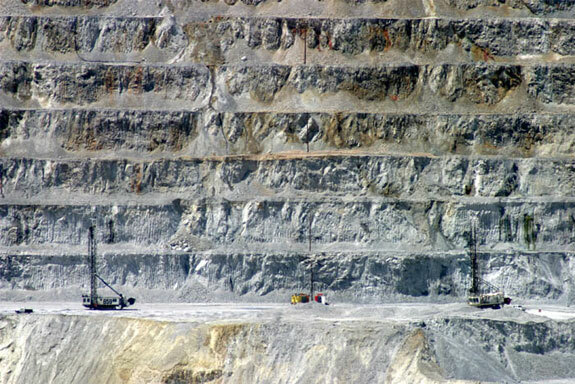 The mine’s owner have plans to drill down as far as 1.3 kilometers over the next three decades. As that happens whole sections of the town of Mirny will have to be torn down and rebuilt further afield. 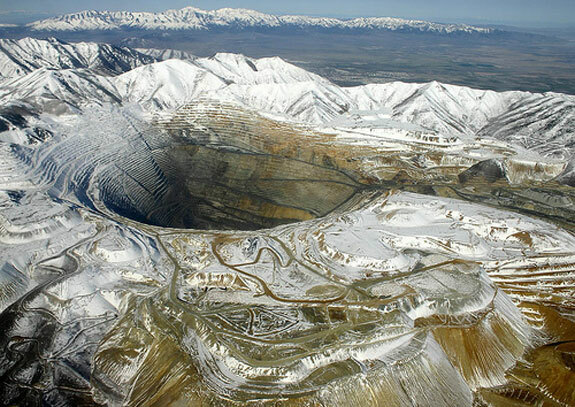 The Bingham Canyon mine is over .75 miles (1.2 km) deep and 2.5 miles (4 km) wide and so, for the moment at least, it beats out Mirny (above) for the title of the world’s largest man made hole. 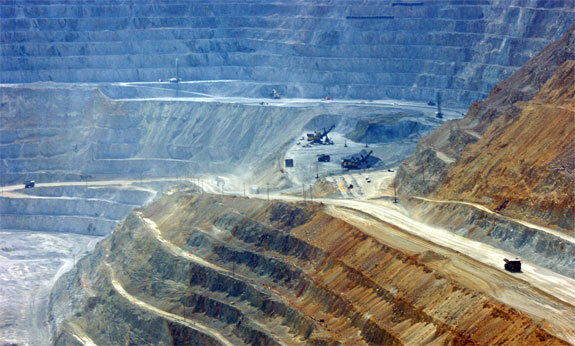 Bingham Canyon is superior to Mirny in another important way too: It is much more travel friendly. Although still a working mine, Bingham Canyon was declared a National Historic Landmark in 1966 and has doubled as a tourist attraction since. Every year from April through October the visitor center here is open for curious travelers. Inside the center are interactive exhibits, mineral samples and a 16-minute video overview of the mine. But the center’s coolest feature is the superb viewing platform from which it is oddly compelling to watch the goings on below. Though the machinery that operates in the mine is massive in comparison to, say, your car, it appears tiny relative to the enormous mine. It is hard to look down at the scene and not imagine that God is a 4 year old boy playing around with his toy trucks. Where To Stay: Bingham Canyon is essentially in the Salt Lake City suburbs. The Jefferson Guest House is a wonderful (and inexpensive) place for backpackers and long-term travelers in downtown Salt Lake. For a hotel close to Bingham Canyon check out the Crystal Inn West Valley. 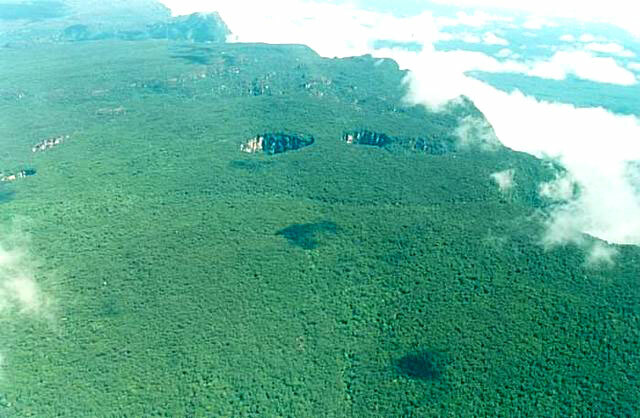 The sinkholes of Sarisariñama are one of these geologic oddities, like the Chocolate Hills of the Philippines, that leave scientists puzzled about how they formed. 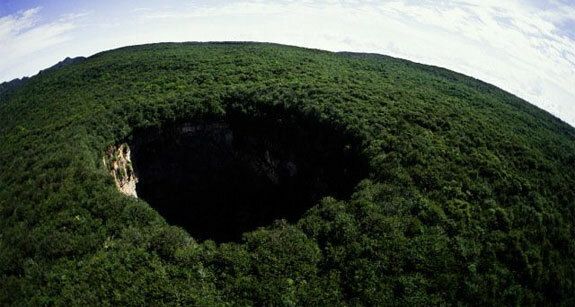 In the case of Sarisariñama they haven’t been puzzled for long—these strange sinkholes were first “discovered” in 1974. Some of the holes are not only perfectly round but, curiously, have a depth that almost exactly matches the hole’s diameter. 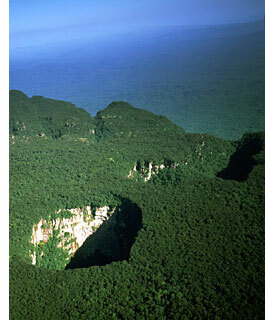 Sarisariñama is a very remote place and is home to several plant and animal species found nowhere else on earth. At the time of writing, the site was not officially open to tourism. This 40km (25 mile) wide spot in the earth was for several decades thought to be an impact crater from a meteor. The fact that the Richat Structure is more of a protrusion than a hole maybe should have been a rather large clue that there was something else going on. 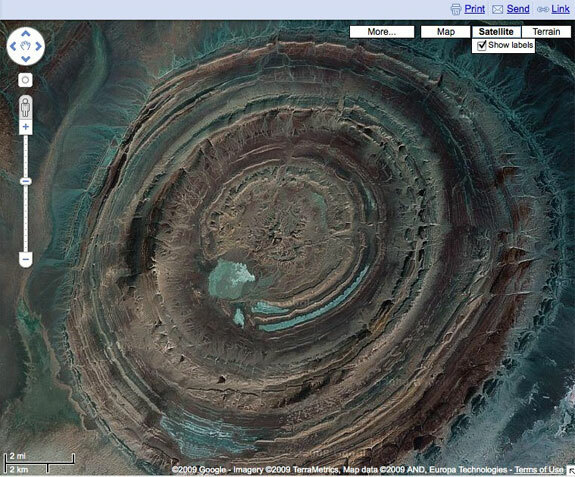 And, indeed, geologists today theorize that the Richat Structure was formed by folds in the rock called anticlines. 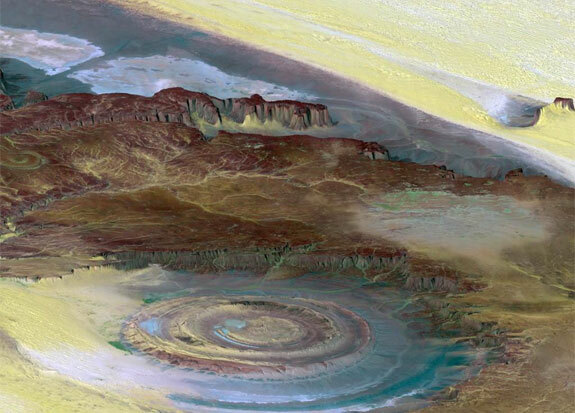 Whatever its geologic cause, the best view of this enormous circular rock formation in the middle of the Maur Adrar desert is from space. Assuming that is beyond your travel budget you can get a pretty good view using Google Maps (click on the first image, below). At ground level, Richat is a stark place that draws some hardy off-road motorcyclists but is otherwise not a superlative travel location. Really massive meteors that strike Earth — such as the Chicxulub meteor that hit in the Yucatán, Mexico and that is thought to have caused mass extinctions — create such devastation that they don’t leave a crater so much as they alter the geology and geography of an entire region. What made the Barringer meteor so tourist friendly (if that’s a term that can be used to describe meteors) is that it was polite enough to fall in a flat and featureless area of Arizona, big enough to create a nice looking crater yet small enough to, you know, not wipe out all of humanity. 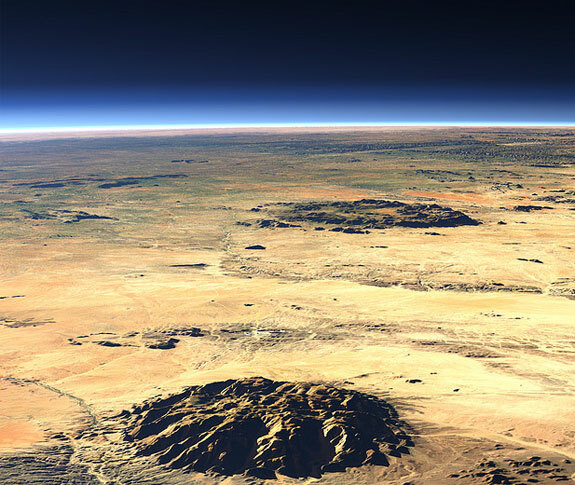 Of course, gazing out over the Barringer Crater it is hard to consider the meteor that created it as “small.” The crater, 40 miles east of Flagstaff and 20 miles west of Winslow, is about a mile (1.2km) wide and 570 feet (175 m) deep. The visitor center at the crater’s edge is open year round. The center itself, with its chain food restaurant and obligatory gift shop hawking I Survived the Barringer Meteorite t-shirts, is rather tacky. But don’t let that put you off—the organized hikes along the western rim of the crater are very cool. Where To Stay: The Sedona Rouge Hotel and Spa offers a scrumptious blend of soothing luxury and outdoor ruggedness; it is about 70 miles from the Barringer Crater. 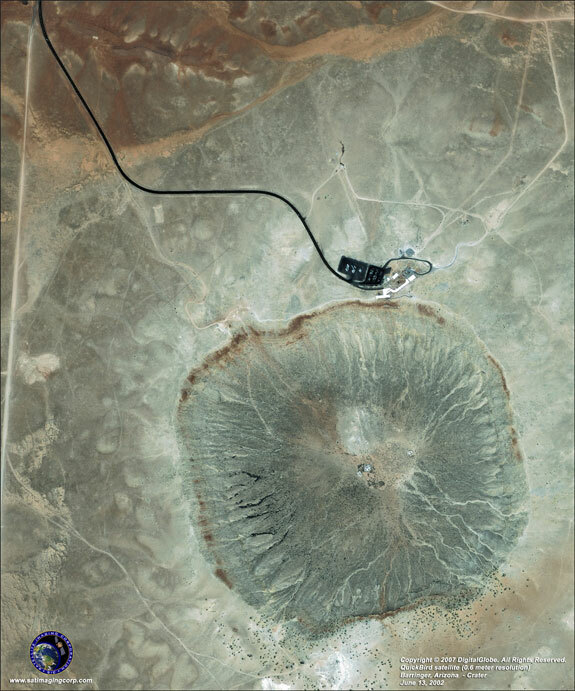 The town of Winslow is a third that distance from the crater but the accommodations there are powerfully unexciting. 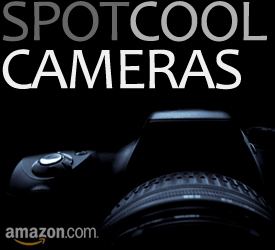 8 Highly Unusual Items You Can Buy on Amazon.com ← really! 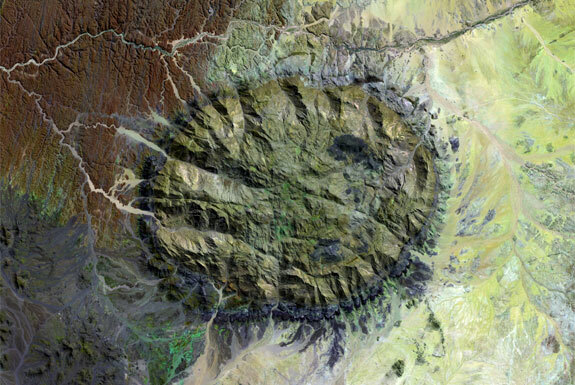 What about the Maragua crater in Bolivia that is in the Andes mountain range, but once used to be the seabed, with evidence of coastal erosion still visible. The Quilotoa crate in Ecuador is also round and impressive! Thanks, Nick. That’s a great suggestion. Great article. 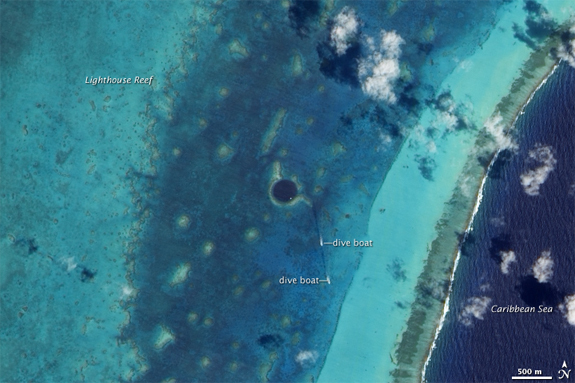 Every time I see The Great Blue Hole, it blows my mind how deep it is. Would love to go there with all that aquatic life. 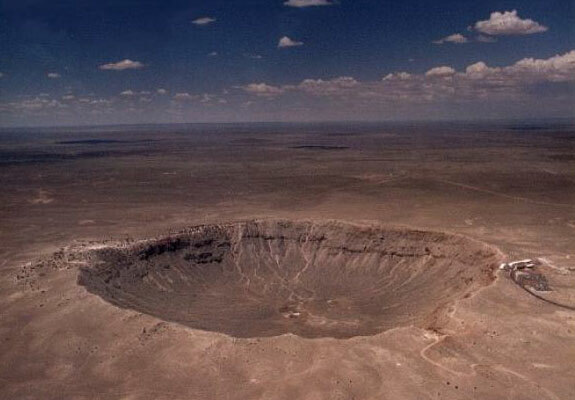 I’m a native and resident of Arizona and never been to the crater.Will have to go. The very first thing that came to mind when I saw the Great Blue Hole in Belize is an image of a giant sea monster reaching out with one massive tentacle and pulling a plane from the sky into its watery depths. And yes, these pictures are beautiful. The world is far too amazing. Crater Lake would have been a really good choice, Holly. Perhaps a post with 7 more cool travel “spots” will make an appearance in the future? very nice picture. thanks for collecting and making this very nice blog and sharing with us. Cool pictures of amazing places, which a few of are definitely worth visiting. Superb comment. We should have been more specific. The organized hikes done through the visitor center at Barrington crater don’t climb down and then wonder to the very middle of the crater. They do dip down into the crater a bit but follow a path more along the rim. Of course, with a good rope ladder and night vision goggles you can always surreptitiously make a try for the crater’s middle yourself. To the best of my knowledge, you cannot hike down into the Barringer crater. You can hike about a third of the way around the rim and back, but unless you are a HUUUUGE VIP, or have worked there as an employee for a long time, you can’t go down. If they’ve changed their policies, I’d love to know so I can book the plane tickets to go back! I thought it was even more awesome (in the true sense of the word) than the Grand Canyon! The next 7 geological spots of interests should come from our solar system. The Great Canyon on Mars named “Valles Marineris” is awsome and so is the Big Red Spot (storm) on Jupiter! Beautiful pictures. That a superb idea, Fletchjustin. Instead of the Caribbean Sea, the Sea of Tranquility perhaps? We’ve been working on a post about the upcoming Virgin Galactic space flights (partly in the hopes of getting a press invite to go on one). Clearly we need to add “Outer Space” to our destination categories. HOW cool is this? love it – really great photos and descriptions. thanks!